This is a question you’re almost always asked in a fast-food restaurant when you order your meal. An employee at the counter wants to know whether you’re eating your meal in the restaurant or taking it somewhere else. Your answer may be “It’s for here.” Then the employee will put your meal on a tray and give it to you. If you want to take it home or somewhere else, then your answer will be “To go, please.” Then she will put your meal in a bag for you. 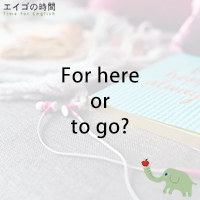 For here or to go? You definitely want to remember this question, especially if you’re travelling in the US. So let’s practice answering this question together. Next Post 「いただきます」と「ごちそうさまでした」 – Bon appetite!